Edward Slinglerland (British Columbia). 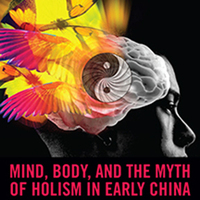 "Mind, Body, and the Myth of Holism in Early China." Free and open to all. Reception follows. Abstract: It is commonly claimed that mind-body dualism is entirely foreign to China—or “the East” more generally. This talk will draw on a wide variety of evidence to debunk this Orientalist myth of holism, including archeological findings, traditional close reading of texts, novel large-scale textual analysis techniques, and work in contemporary evolutionary anthropology and cognitive science. Embracing an embodied view of human cognition gets us beyond strong social constructivism and its accompanying cultural essentialism, giving us a better way of studying cultures and allowing us to more accurately and rigorously assess claims about the philosophical and religious historical record. The talk will conclude by considering how early Chinese views of mind-body relations do, in fact, differ from some modern Western conceptions, and how they might help us get a better grasp on issues such as moral reasoning or education. The James and David Orr Memorial Lectures on Culture and Religion bring to Dartmouth each year scholars and writers whose achievements are at the highest level, but whose main fields of interest are not necessarily religion. Past Orr Lecturers include historians, anthropologists, novelists, biologists, and philosophers.